Want to Find a Job? 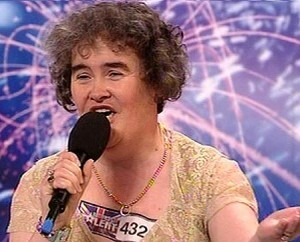 Pull a Susan Boyle. Earlier this year, Susan Boyle became famous for being able to sing well even though she was neither young nor pretty (apparently we find this surprising!). Simon Cowell rolled his eyes when she first walked on stage to sing on his TV talent show The X-Factor, although he soon warmed to her when she began to sing. So How Did it All Shake Out? Now it’s December and both Adam and Susan released their albums on the same day. One sold 1.8 million copies in 3 weeks and topped the US charts three weeks in a row. One sold 290,000 copies in the same timeframe, most of them in the first week, and dropped from #3 to #30 by the third week. But surprisingly, the chart-topper was Susan Boyle, not Adam Lambert, and she topped charts in other countries too, selling an amazing 715,000 copies in the UK in just 2 weeks (Adam sold just a few thousand copies). Her US debut edged out Eminem as the biggest first week seller of the year. So why did one succeed and one struggle to make a splash? And what does that mean for your job search? My own theory is that Susan Boyle is meeting a ‘need’ and Adam Lambert isn’t. And to me that’s the key takeaway for anyone marketing themselves, whether a job seeker or a small business owner. There is no one else doing what Susan is doing – or at least not anyone the public knows about. Millions of middle-aged women have been inspired by her story and by her voice. They want to buy music, but there’s very little on the charts that they enjoy. So of course when they get the chance, they rush out to buy the record. Adam is a little different. His music is Lady Gaga/Pink/Madonna in style. But those 3 ladies are all going strong and doing what they do better than he does. The audience isn’t really looking for another Lady Gaga because they already have one. (By the way, the guy who beat Adam had even worse sales. His CD was kind of a cross between Jason Mraz and sub-Rob Thomas. But since we already have Jason Mraz and Rob Thomas, it hasn’t taken off). Most people approach their job search by figuring out what they have to offer. Some people follow the personal branding movement, which is all about spending time analyzing yourself to figure out what makes you special. But I think Susan Boyle highlights the flaw in this approach. If no one needs your special talent, no one will buy it – or you. I think that when you start your job search, you should begin at the beginning – what do employers need? Once you know that, you can identify what makes you uniquely valuable to those employers. But you’ll be doing it from the perspective of what the market needs – not a selfish focus on yourself and your gifts. If you follow my advice, I can’t promise you a chart-topping album – you’ll need Simon Cowell for that 😉 But I can promise that you’ll get more interviews than the people who are not focused on meeting a need. Remember this when looking for a job (or trying to market a small business) – it’s not about you. It’s about what your customers/target employers need. Read more about Career Success, Job Search. Bingo – you hit the nail squarely on the head. I’m completing the resume processes with an executive who realizes that, though his mergers and acquisition experience is a substantial ‘win’ in his recent career story, spotlighting it ‘center stage’ on his resume may NOT be what the target reader is hungry for to meet their needs (and in fact, this M&A experience may even ‘detract’ from the job seeker’s value in the hiring company’s eyes). Therefore, we ferreted out what’s most important to the target company vs. what initially the job seeker may have felt most excited about. That means a lot coming from you. And I so agree about the M&A experience. Susan Boyle’s performance and story frame things much more differently than Adam Lambert. While her voice is good, there was something else that generated all the people seeing her on YouTube and wanting more of what she had. How this applies to a job search is pretty easy if one wants to think that there is something to how one frames the story. I think there was an appetite for Susan Boyle that wasn’t quite the same as Adam Lambert even though both came from reality shows.